If part or all of your clinical trial will be conducted outside the United States, you’ll be juggling the regulations and requirements of multiple jurisdictions. You’ll also need to ensure that your IMPs get to patients and biospecimens get to the lab without delays. So you need a clinical supplies management service that will make sure your trial operates on time and on budget. But do you know how to find the partner that can handle all of these logistical complexities? 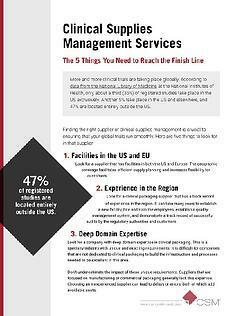 This tip sheet lists the five most essential criteria to look for in a clinical supplies management service provider. From location to experience, find out what criteria the provider should meet.